I visited Beirut for the first time in March – a long-anticipated and hoped-for trip. My feature on that cosmopolitan city’s great food and warm-hearted hospitality appeared in the Irish Examiner last Saturday and is reproduced below. First published in Irish Examiner 25 August 2018. It’s that evocative mixture of food and history and people that drew me to Beirut. The Lebanese capital, once known as the Paris of the Middle East, sometimes struggles to throw off its war-torn past: I’ve never had people react so strongly to a weekend destination. “Beirut? You’re going to Beirut?” friends asked. Then, hesitantly, as if to double check, “In Lebanon?” We’re of the generation that grew up with an awareness of Irish peacekeeping missions stationed in Lebanon, Christmas broadcasts featuring the Irish soldiers there speaking to their families at home in pre-Skype days and the kidnapping of Brian Keenan. 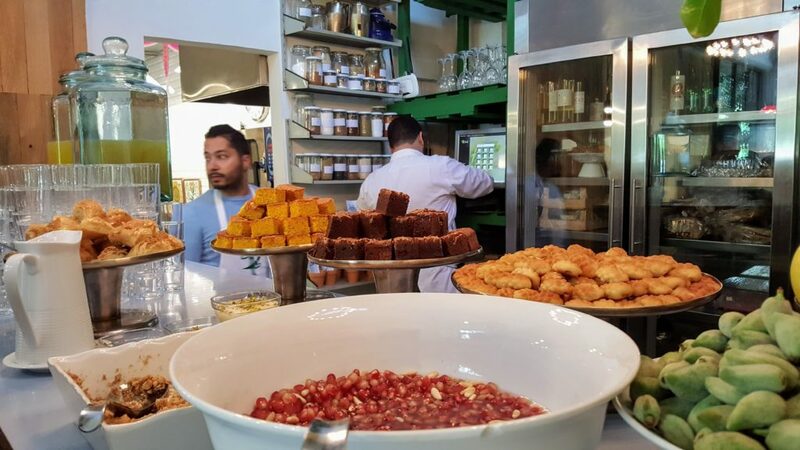 My perceptions of Lebanon, however, came from reading Claudia Roden’s seminal A Book of Middle Eastern Food and the writings of Lebanese chefs and food writers Greg Malouf and Anissa Helou, sparking a hunger that only a visit could assuage. In 2006, my Kiwi partner and I had planned a trip there but the outbreak of the 34-day Israel–Hezbollah War voided all travel plans. Life intervened and the trip never happened – although it was never quite forgotten either as I made tabbouleh in in my Irish cottage kitchen, whipped up batches of hummus, discovered the exotic flavours of pomegranate molasses and sumac, and dreamed of the breakfast flatbread called manoushe. I renewed my vow to visit Beirut after I first met Kamal at the 2010 West Cork Food Festival in Skibbereen. 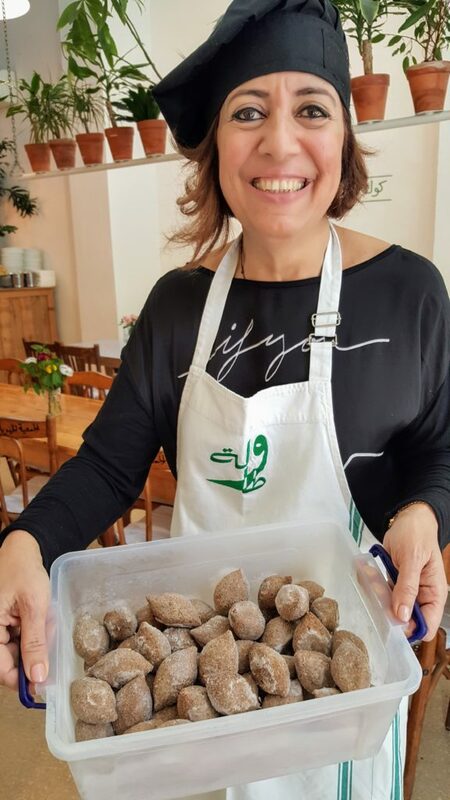 He had set up Souk el Tayeb, the first farmers’ market in Beirut in 2004, and had just launched Tawlet, a co-operative restaurant – or farmers’ kitchen – where lunch is cooked by a different woman every day, using food to tell the story of her region and traditions. By bringing people of different backgrounds and religions together to share food, he was playing a part in uniting his divided country through food, transforming people’s lives by enabling them to earn a living through growing and cooking. He spoke about the many different ingredients that go into making a small, religiously and ethnically diverse country work together. Despite its size (just over 10,000 square kilometres or 1/7th of Ireland) Lebanon, a former French protectorate, has an similar population to Ireland of around 6 million people. Like Ireland, it’s also recovering from a recent civil war, which lasted from 1975 to 1990. Unlike Ireland, it is bordered by Israel and Syria and the Irish Department of Foreign Affairs recommends avoiding certain areas – North Lebanon, which is close to Syria, and the southern suburbs of Beirut (dominated by Hezbollah). First impressions? Chaos! As we sat, on a gloriously warm March night, in a taxi from the airport, our driver – while dodging and weaving with style – explained to us that traffic jams were normal, there was little public transport and traffic laws were few. In short, better to be driven than drive. To find our Airbnb rental in a city without street names, the owner, Selim, had sent me directions that were worthy of the Irish countryside: head to the large supermarket, drive down the alleyway by a woman’s clothes shop and the apartment is in the building behind it. He just stopped short of saying “if you get to the coffin maker’s, you’ve gone too far.” (Although we did find the coffin maker’s shop later.) 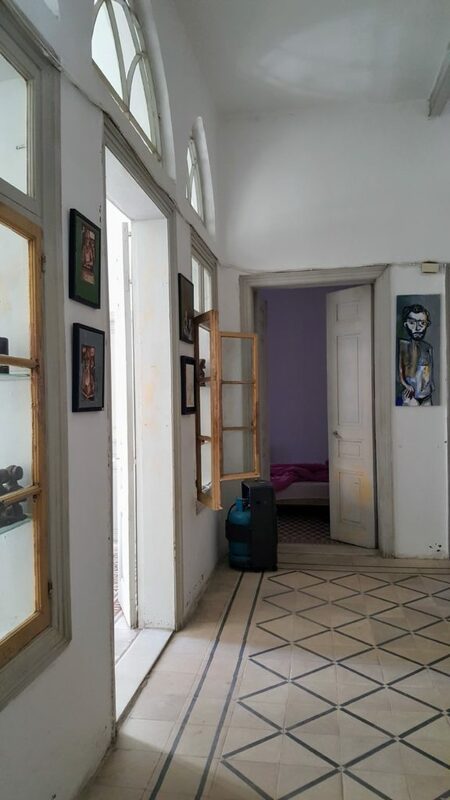 Selim, who has an artist’s studio in the same building, met us at the door to show us around the simply renovated 1940s apartment, with several balconies, mosaic floors and walls adorned by his own bold art. He gave us some pointers for the area, reassuring us that it was safe, and generously invited us to join him for coffee the next day. It was just one in a series of encounters with warm-hearted, hospitable Beirutis that made us fall in love with their city. And then there was food. Oh yes, there was the food. 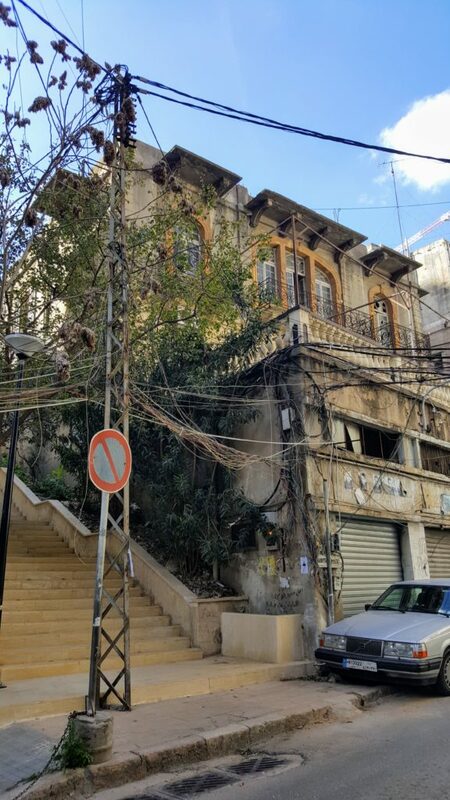 As we explored Beirut, wandering the rickety, disappearing footpaths, avoiding tooting taxi drivers that tried to pick us up just as we were concentrating on crossing the road (no easy task) and all the time gazing, wide-eyed, at the mixture of construction and destruction that marks a city on the move, we ate. There were night time feasts of Lebanese mezze in the vibrant Gemmayzeh neighbourhood; spicy sojok (little sausages) and smooth chilli hummus, spinach sambousek or pies, lamb kibbeh (a type of meatball) and – yes – tabouleh. 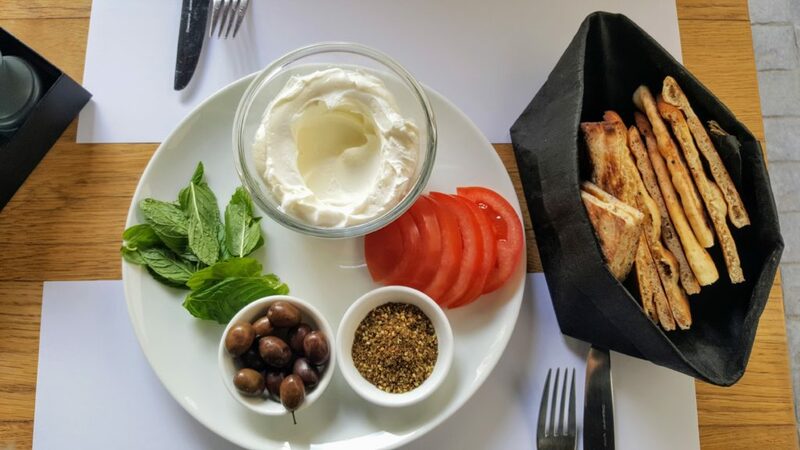 Breakfast consisted of olive oil-drizzled labana – a tangy yoghurt cheese – and foul medamass (a cumin-spiked fava bean stew) that were scooped up with flatbreads and eaten with olives and ripe, dribbly sliced tomatoes. 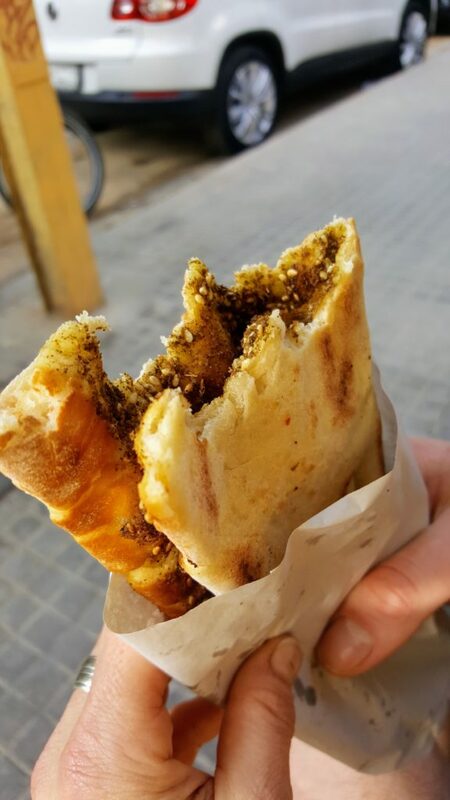 Walking along Armenia Street, we discovered the streetfood I had been dreaming of: freshly baked manoushe, flatbreads topped with olive oil and za’atar – a delicious blend of dried wild thyme, sumac, sesame seeds and salt. Think thin pizza, warm from the oven, redolent of herbs and tart, tangy sumac. Everywhere we went we ordered too much food – but still managed to eat each and every delicious bite. 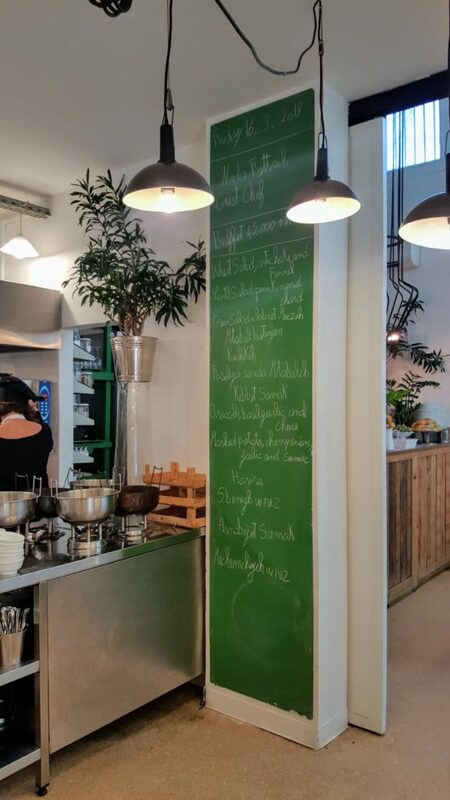 Enticed by the aroma from the kitchen at Tawlet Beirut, I stayed for lunch. The meal there was served buffet-style with Nadia, that day’s cook, behind a bountiful display which included heaping platters of colourful salad (wheat, artichoke and fennel salad; lentil, pumpkin and chard; green salad with labneh), a creamy aubergine dip called mutabal, torpedo shaped lamb kibbeh in yoghurt with fresh coriander, diamonds of fish kibbeh on grilled onion and sultanas, and, my favourite, fish served in a tahini citrus sauce. If you’re an Ottolenghi fan, you’ll be in heaven. For 45,000 LBP + vat (about €25), you can fill your plate, return to taste something that you might have missed and then take a quick trip back to check that tahini citrus sauce was still as good as you had thought. Then there was the desert buffet, with platters piled high with fresh fruit and bakalava, fresh green almonds to nibble on, fuzzy skin and all, and little bowls of creamy, rosewater scented, pistachio-topped milk pudding. The next morning I visited Souk el Tayeb, the farmers’ market where everything started back in 2004. 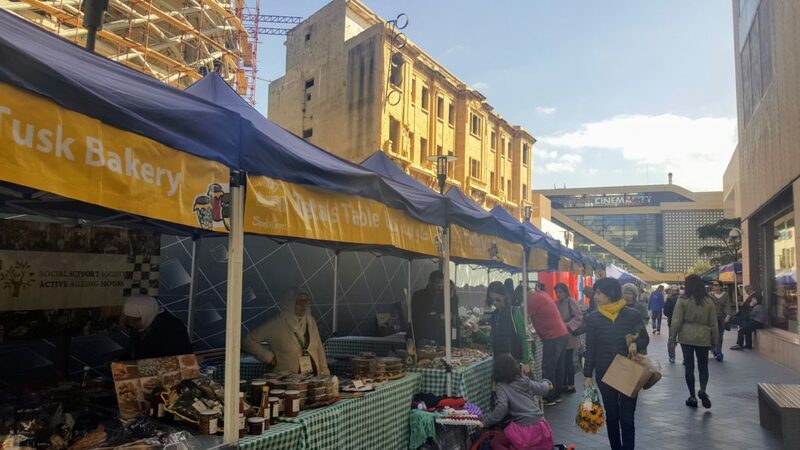 It’s worth arriving hungry; this open-air market in elegant downtown Beirut, which brings producers of all different religions and regions into the city from rural Lebanon, has many temptations. We arrived early to see the market, which features food from mixture of traditional and innovative producers, was already in full swing. Older Palestinian ladies from the Active Aging House in Burj Al-Barajneh refugee camp sold black sesame cookies and their own needlework alongside Tusk, an artisan bakery, who had sourdough baguettes, black rice and poppy seed loaves alongside and – be still my beating heart – flaky, buttery, za’atar croissants. Tables were piled high with bags of the long, slim pine nuts that were sprinkled on many of the dishes we ate, different versions of za’atar – everyone has their own interpretation – and rows of bottled homemade, tar-black pomegranate molasses. A woman energetically flipped dough on to her saj, a domed griddle, to make warm wraps for labneh and fresh greens while, around the corner, Jesse of J Jar had a selection of homemade seed and nut butters (pecan vanilla for the win). It was the first time at the market for the ladies behind Zewedetna, an initiative to empower Palestinian and Syrian women in Ain el Helwe, the largest refugee camp in Lebanon, who arrived with a treasure trove of hot savoury dishes to eat on the spot and irresistible crumbly date cookies. It was also the best place to pick up the ingredients to make tabbouleh – large bouquets of robust flat leaf parsley, musky, sun-drenched tomatoes and nobbly, misshapen, fragrant lemons – for each person to combine according to their own particular recipe. Like farmers’ markets the world round, shopping involves an opportunity to talk to producers about what they are selling, to hear the story behind each delicious mouthful, to make a difference with each purchase – to see Kamal’s “similarities beyond our differences.” When socio-political engagement tastes this good, it’s hard to resist. Although there are no direct flights from Ireland, Lufthansa, Emirates, Air France and Turkish Airlines and Air France all have connecting flights from Dublin to Beirut, with stop overs in Frankfurt, Dubai, Charles de Gaulle or Istanbul. Pre-arrange a taxi with your hotel / accommodation to take you the 9km into the city centre or look for the licenced drivers in white taxis with the airport logo. We stayed at in a lovely old apartment, which I’d recommend to any vintage fans (search Airbnb for National Heritage Character, Bayrut, €88 per night). Guesthouse Beit El Tawlet, just above Tawlet Beirut, was just opening when I visited, with a sun-drenched terrace that has views encompassing the mountains and the sea ($120 dollars + VAT, breakfast included). Hotel accommodation at Saifi Suites is comfortable and central. Backroom Beirut has a great selection of beers and spirits, many Irish, and is a lively spot for a drink and to meet locals. (Disclosure: it also stocks beer from Eight Degrees.) Out front is a fine wine bar, Les Caves de Tallevent, with an incredible international selection, alongside some well chosen Lebanese wines. Many of the local vineyards, iconic spots like Château Musar and Château Ksara, can be visited on day trips from Beirut. Check out the Souk el Tayeb website for information on markets, restaurants, accommodation and festivals. Sounds like you’re well traveled, Joe! While we were there – which is back in March – we did go out of Beirut but only a little way north, to Byblos. The ruins there are well worth exploring – I’d recommend paying for a guide to get the most out of it. There’s also a museum in Beirut, which I didn’t get to. Next time! I don’t know what the current situation is in either Baalbek or Tripoli. I think that you’re best to ask the people on the ground and your hotel should be able to help you there. It’s a big of a scramble at the airport so pre-book your taxi or have the hotel send one. Once you’re there, it’s easy to organise things. Have an amazing time, Joe, and make sure you check out Tawlet for the buffet lunch some day. It’s a real treat.